The Brandywine Bathroom Vanity Collection boasts a handsome, deep finish with detailed raised trim accents that allow it to adapt to several bathroom designs. The distinctive dark finish reminds us of antique furniture that has graced an estate for over a century, so we love traditional décor with the Brandywine Collection. A more modern décor can also handle the depth that the distinctive deep finish offers, and the Brandywine Series adds instant warmth to more contemporary décor. Viewing Tip: To see a close of each RTA vanity along with a closeup of a sample door, click on the description of the individual items on the order pages. 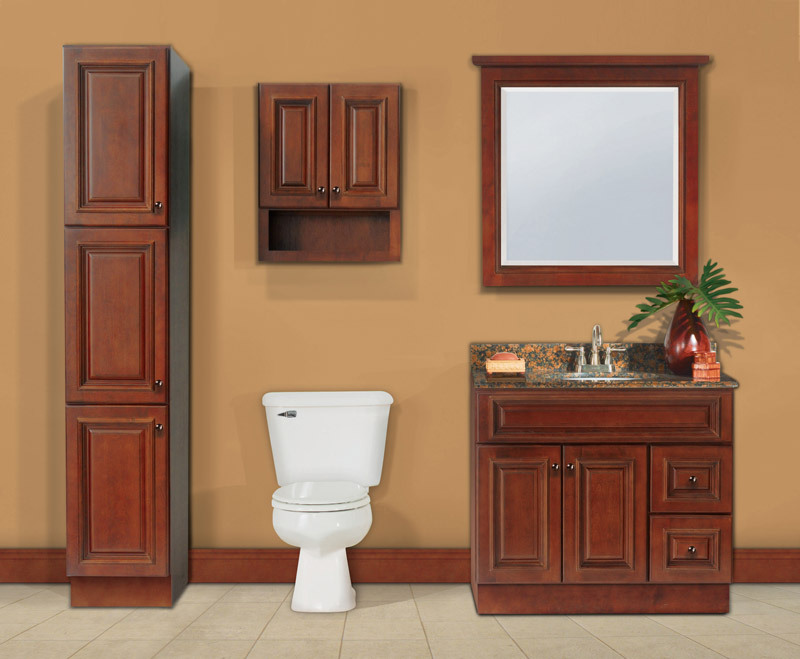 With its deep, rich tones, the Brandywine Collection graces traditional and transitional bathroom designs with class. Light warm colors, such as a creamy almond, play off the warm, red tones of the bathroom vanity, and offer the start of an excellent bathroom color scheme. For the Brandywine Collection, less can be more, and you can save the bolder colors to use as accents so as not to overwhelm the stunning cabinetry. The Brandywine Bathroom Vanity Collection demands quality countertops, and RTA’s Beige Granite Countertop offers an excellent contrast along with complementary veining that picks up the rich finish. Cultured marble or porcelain countertops for a more seamless style are customer favorites as well. When it comes to fixture finishes, the Brandywine Vanity can handle any and all - including brass, nickel, chrome and bronze. For flooring choices for the Brandywine Series, we prefer larger, creamy colored tiles to offer a handsome contrast with the cabinetry. For a modern look, not to mention eco-friendly, a bamboo floor in a light tone also offers a nice contrast, while marble or granite tiles is a classic upgrade for seamless style in a master bath or guest bath. •	A bathroom with a single-color design and carefully chosen accent pieces can become a tranquil oasis - consider using tone-on-tone shades for a more understated elegance. •	Center your bathroom design around a focal point to add visual drama to the room - the Brandywine Vanity is dark and distinctive, and with proper lighting, makes an excellent focal point. •	Use a color wheel like the professional interior designers to create your color palette. Use the wheel to choose two adjacent colors you love, and balance them with their opposite colors. To get warmth in the bathroom, choose two soft tones. For a more energetic feel to the room, choose deeper colors that will give your bathroom a more vibrant feel. With the rich finish and handsome details, the Brandywine Collection has the quality construction to back up its good looks. All pieces are solid wood, there is no particle board used in this cabinet, or any RTA cabinet for that matter. Each piece in the Brandywine Bathroom Vanity Series is 32-1/2 inches in height and 21 inches in depth. We also offer the Brandywine Kitchen Cabinet Collection that matches the Vanity Collection, so cabinetry can be mixed and matched to offer endless design possibilities and custom storage solutions. The Brandywine Collection is reminiscent of a fine, aged antique with clean details for modern appeal. It is a timeless classic that will be sure to grace your home for many years to come.